The history of pinstriping and custom paint stretches back to the era of the horse-drawn carriages, the provenance of the royal, wealthy, and otherwise privileged. Henry Ford rolled his first Model T off of the assembly line in 1908 and said, “Any customer can have any car painted any color he wants, so long as it is black.” By 1903 Messrs. Harley and Davidson were in production in Wisconsin, manufacturing 150 motorcycles per year. By WWII Harley-Davidson and Indian Motorcycles were producing upwards of 70,000 motorcycles for military use. Military green was the norm. Pinstriping and custom paint reappeared on airplanes during WWII. Bomber crews developed strong bonds with the planes they were flying, and affectionately decorated them with nose art. It was believed by the flight crews that the nose art was bringing luck to the planes. Post-WWII, in Compton, CA; a mechanic and son of a sign painter, Kenny Howard a.k.a. Von Dutch started pinstriping vehicles. Howard was designated “The Godfather of Modern Day Pinstriping,” Others such as Big Daddy Roth, George Barris, Robert Williams followed and became masters of the craft. 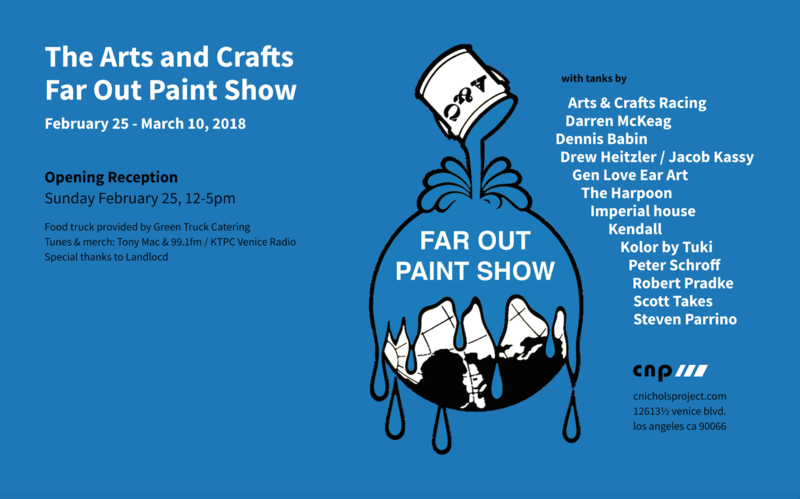 It is in this spirit of radical finishes, that C. Nichols Project is stoked to present the West Coast version of the Arts and Craft Racing Far Out Paint Show. First presented as part of the Brooklyn Invitational Custom Motorcycle Show in late 2017, the West Coast version adds artworks and photographs from those considered to be part of Arts and Crafts Racing, an informal umbrella of artists and industry creatives who are also crazy for car and bike culture, especially racing and its aesthetics. We invite you to arrive on Sunday, February 25 between 12-5 via whatever your choice of transportation (bikes for sure welcomed and encouraged) to enjoy eats and drinks by Green Truck. Tunes provided by Radio KTPC 99.1 “Radio from Speedway to the Freeway!” with DJ Tony Mac spinning.